Good morning, I hope you all had a great weekend and managed to avoid the hailstorms that scattered over the UK the last couple of days. Whilst browsing the internet this weekend for more party ideas and inspiration I came across a rather fantastic idea for your sweetie tables. 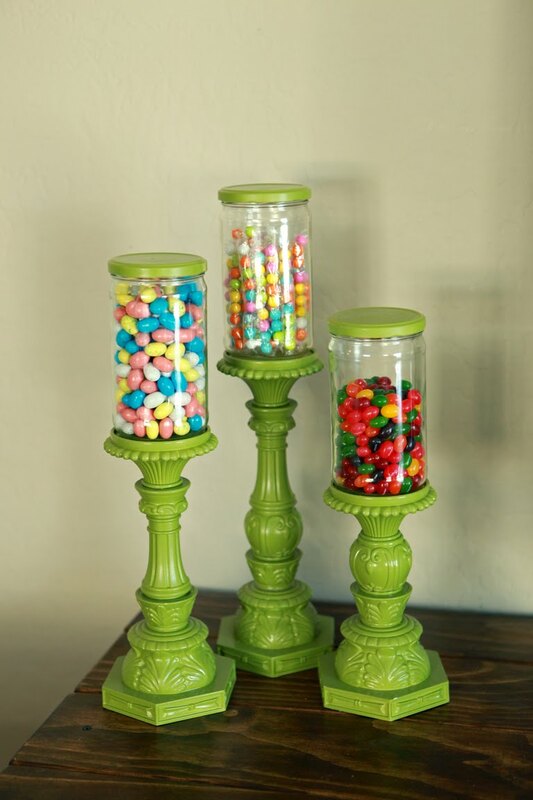 This idea would work with various sized candlesticks and jars and I am sure you will agree looks very effective, especially in bright, bold colours. However I think these candlestick apothecary jars would also look amazing in white for a grown up sweetie table. Then in between parties you can use them to store buttons in! Be sure to let me know if you make these candlestick apothecary jars, I would love to see them!